Prior to its development, Oak View was just uninhabited land between Ojai and Ventura. Watermelons grew where Dahl’s Market is at 445 Ventura Avenue and apricot orchards covered a great deal of the remaining land. In the late 1930s, people began to build homes there, called the place “Oak View Gardens”. Among Oak View’s earliest residents was the Hiram Watkins family. Hiram was born in 1866 in Bowling Green, Kentucky. When his parents could not compromise their marital or political differences, Mr. Watkins took his older son, Glyme, to Texas, while his wife, Narcissa, after selling their Missouri home, returned to Kentucky with Hiram. Hiram married Allie Belle Delp and they set up housekeeping in Summerfield, Kansas, where he grew broom corn and manufactured and sold brooms to support his family which soon included two children, Percy and Florence. Around 1892 they moved to Sterling, Nebraska, opened a rag carpet company and Allie Belle gave birth to four more children, Elva, Ruby (Berry), Clifford and Fern (Munger). In 1901, the Watkins family moved to California from Nebraska and rented land in Oak View to raise cattle, hogs and hay. This is where Jane and Irene were born. Around 1903, Hiram purchased seventy-five acres of land on a hill east of Highway 33 in what is now Oak View for $2500 and tended an apricot orchard there. When it seemed that automobiles were here to stay, Hiram opened a service station/grocery at the corner of what is now Watkins Way and Ventura Avenue in Oak View. Allie Belle took over some of the responsibility for the orchard. When the bottom dropped out of the apricot market in 1928, Hiram pulled out most of the trees. He went back to making brooms which he sold to merchants in Ventura, Santa Barbara and Los Angeles. When things were slow, he went door-to-door. He, reportedly, made the brooms in a barn near Mirror Lake. Percy Watkins married Effie Crose, whom he had met when she worked on the family’s apricot ranch in 1917. She was in Oak View helping to care for her brother and signed up for the pitting crew to earn money for college. When the Depression hit, Percy and his Effie moved in with his parents so they could help each other through this period. They remembered eating popcorn from the broom corn for breakfast cereal. They also grew peanuts and often had pan-roasted peanuts for an evening meal. They had plenty of fresh milk, though, and they sold it and wood to buy groceries. One year the $7 a month that came from selling their dairy products was the only income they could count on. Percy and Effie rented the old Kennedy house for a while. Hiram died in 1942 and Allie Belle in 1951, after which Percy and Effie moved back to the ranch land on the hill where the apricot trees once grew. They brought a trailer onto the property and created a lean-to outside it. In the meantime, Percy, who was working in the oil fields by then, was bringing home lumber and scrap wood from the oil derricks and storing it on the property. When the telephone company took out the square telephone poles between Ventura and Ojai, Percy brought some of those home. Effie’s brother brought them truckloads of rock from a quarry in Northern California where he worked-all of this for their future home. Effie drew pictures of her dream house and Percy started building it in 1961 using the materials he had been hoarding-the square telephone poles as beams, the stone as flooring and to build the massive fireplace. The house didn’t go up overnight. In fact it would be another ten years before Effie realized her dream as the Watkins didn’t move into their home until 1971. 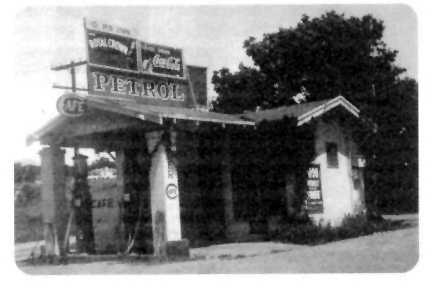 Mrs. Jessie R. Caldwell opened a gas station and grocery in Oak View Gardens in 1927 where the Shell Station is on Highway 3 and Santa Ana Road. Reverend Craig established a Holiness Church in Oak View in 1928. By 1929, it was necessary to start a school and it opened with sixty-eight pupils. There was no heat in the building, so school started at 10 am to give the building time to warm up before the children arrived. There is mention of a library in Oak View as early as 1930. At one point it was housed in a garage. In 1945, the community created a memorial park at Apricot Street and Mahoney Avenue. It was named, Glenn Memorial Park in memory of Captain Glenn A. Loban and others who had lost their lives in the war. Local families of servicemen planted shrubs and roses and labeled them with the names of their sons. The above is excerpted from Patty Fry’s book The Ojai Valley: An Illustrated History, available from Matilija Press. Click on the book image to purchase. I have lived in Oak View for the last 36 yrs the deed to my house has me living in ” Oak View Home Spring Gardens” lot # 13 . The property next to mine was owned by the Post Master of Oak View from 1953 until his wife passed in 2008 ( Meryl & Eva Shelley) what great stories they had. They had some o the original apricot trees on their property. The new owner has removed all but 2 . My brother, Mitch, mentions apricot trees. So, does the story. In the 1960’s, our parents would load us kids up into their 1958 Ford stationwagon and drive us to Oak View to pick apricots. We’d park in the parking lot of a church (now, the Calvary Chapel) that was on the corner of Mahoney Avenue and Apricot Street. Apricot Street had old apricot trees lining both sides of the street. I don’t believe that any of these trees were on private property. I seem to recall that they were on the dirt road shoulders. Nobody cared if you picked the apricots. That’s probably because all the neighbors had apricot trees on their lots. After I moved out of my parent’s home, I used to pick apricots along Apricot Street into the early 1970’s. I drove down the length of the street a couple of days ago to see if any of the trees remained. I was saddened by the fact that I was unable to locate a single old tree. Great memories though! We had a very mature apricot tree on our property when we moved to our house in Oak View 26 years ago. I am proud that we kept that tree in our yard ,and it still produces lots of delicious apricots throughout the end of june and into july. you are welcome to visit and anytime! My wife and I bought a home in Oak View on Rio Via. Found out that the real name of the street is/was Rio Viaduct. And of course that Oak View was originally Oak View Gardens. Kind of Ventura, which has been San Buenaventura. Everything was indeed better, back then! Per chance, was the name “The Longhorn”?